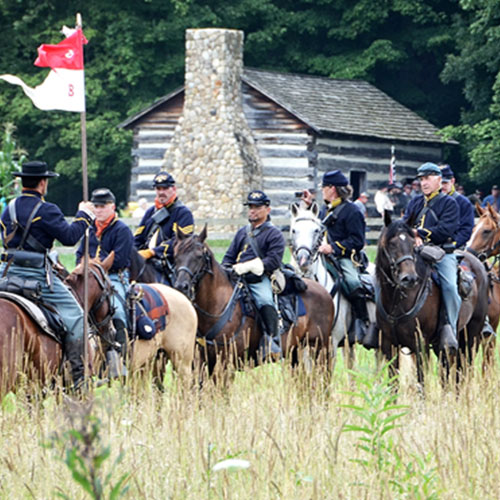 Thousands of visitors and reenactors flock to Hale Farm & Village annually for this popular summertime event—the largest annual Civil War reenactment in Ohio. Meet soldiers, cavalry and civilians. Hear the sounds of battle and smell the gunpowder. Shake hands with President Lincoln or shop for a hoopskirt. Don’t miss the excitement! Each participant will receive a Reenactor Pass, which must be carried at all times, and a Parking Pass, which must be in display in their vehicle, at the Registration Tent upon arrival. Breakfast will be distributed as rations at Command Staff Headquarters on Saturday morning during public hours. Please bring cookware to prepare your breakfast. All participants must check in at the Hale Farm & Village Registration Tent upon arrival. The Registration Tent is located at the end of the Main Driveway. The tent serves as the Check in for all Civil War Reenactors, including those who pre-registered. Walk in registration is permitted, and Commanders will be contacted concerning all additional reenactors. After check-in, all reenactors must report to Federal or Confederate Headquarters prior to setting up camp. Reenactor parking will be in the South Pasture, the fenced in field to the south of Hale Farm’s main driveway. This area will be designated as such during the event. All vehicles must be removed from the museum grounds by midnight on Friday and vehicles are prohibited from entering museum grounds until after the battle on Sunday. Please notify HF&V of any special needs before the event. Parking passes will be distributed at the Registration Tent and must be displayed at all times in your vehicle. No camp is to be set up prior to 10:00 am on Friday, August 10 without permission from the HFV Director. Camping areas are near water and restroom facilities. Electrical hook-ups and showers ARE NOT available on the grounds. Ice for personal use (coolers, beverages, etc.) may be purchased at the Hale Farm & Village Gatehouse Café’ during regular business hours 9:00 am to 5:00 pm. All participants must conduct themselves in an appropriate manner for a family-oriented museum at all times. Children under the age of 16 must be accompanied by and supervised at all times by a legal guardian; children under the age of 16 are not permitted to carry a replica firearm. Personal safety is of utmost importance to Hale Farm & Village, event participants, and the attending public. ALL PARTICIPANTS MUST STRICTLY ADHERE TO ALL NATIONAL LIAISON COMMITTEE SAFETY REGULATIONS (NLC). A copy of these rules is available at www.usvolunteers.org. NO ALCOHOL is permitted on the grounds of Hale Farm & Village. NO PETS are permitted on the grounds of Hale Farm & Village. Sod is to be removed before digging any fire pit, and is to be replaced Sunday morning. All unused firewood must be returned to the main woodpile at the close of the event. Trash containers, provided by Hale Farm & Village, are to be utilized at all times. Noise should be limited in all camps during the evening hours. NO CLEATS are to be worn in any museum buildings because of potential damage to the historic flooring. PLEASE NOTE: Hale Farm & Village reserves the right to ask that anyone who does not maintain good conduct or act in a safe manner to leave the grounds immediately. Tear down will begin Sunday, August 13, AFTER the event closes to the public at 5:00 pm. If you have special needs in this regard, please contact HFV at (330) 666-3711. Additional restroom facilities have been placed throughout the Museum Grounds. Please note that Hale Farm historic and modern buildings are locked during non-museum hours, including permanent bathroom structures. Firewood is available for each encampment, Union & Confederate, on a first come, first served basis. Registered reenactors will receive a firewood token at the Registration Tent upon arrival. Fires in camp are permitted. Please dig out sod, and replace at the end of the weekend. Active fires must be attended at all times. Water Buffalos have been placed throughout the property for your convenience. They will be refilled once on Saturday. Ice may be purchased at the Hale Farm & Village Gatehouse Cafe during regular business hours 9am – 5pm. The Civil War Ball will begin at 8:00 pm on Saturday at the Carriage Pavilion behind the Meetinghouse. Complimentary Breakfast Rations for all pre-registered reenactors will be offered. Breakfast will be distributed as rations at Command Staff Headquarters on Saturday morning. Please bring cookware to prepare your breakfast.